A couple of weeks ago, Hope stopped by the local Restaurant Depot to purchase some chicken to replenish the ice cave. When she came home and we started trimming up the beasts in preparation for the vacuum sealer, I was amazed at their size. These specimens could not have come from some standard barnyard, corn fed bird. They were huge, almost prehistoric in stature. These birds had to have escaped from some government run genetic engineering lab. 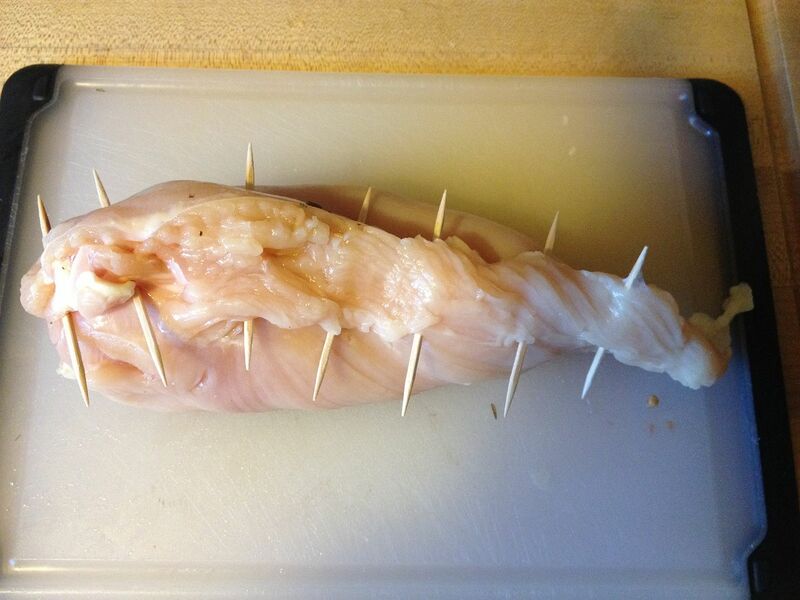 My mind started contemplating the possibilities of grilled stuffed chicken breast. With the last plum tomatoes of the season staring at me from their counter top bowl, a plan came together. The weather is still warm and our grilling days are few. 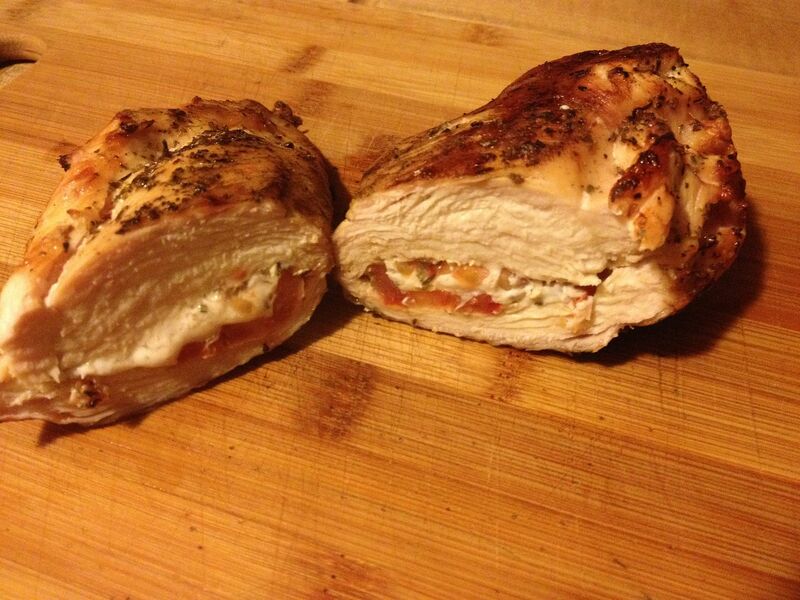 Grilled chicken breasts stuffed with tomato, mozzarella, and Italian spices were in order. 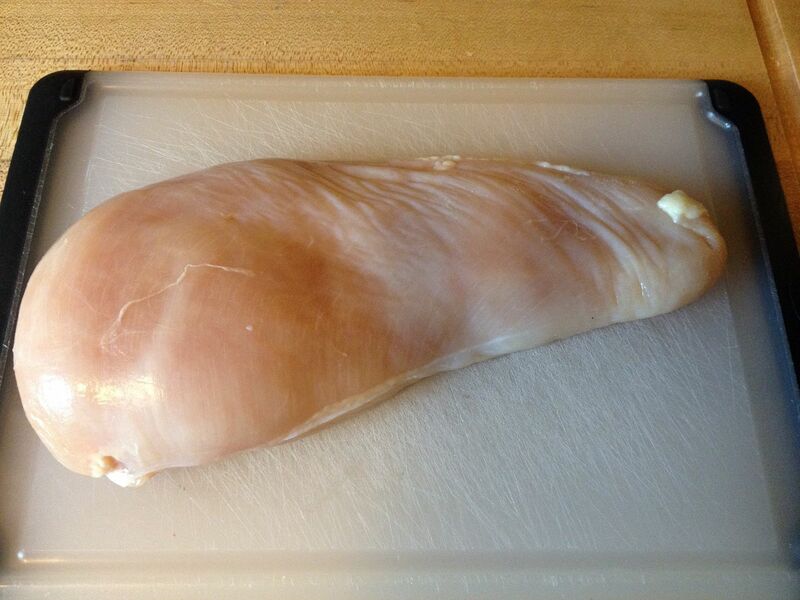 First, I grabbed a sharp knife and split the breast almost in half right down the long axis to create a pouch. Next, I thinly sliced the plum tomatoes and some fresh mozzarella as well. 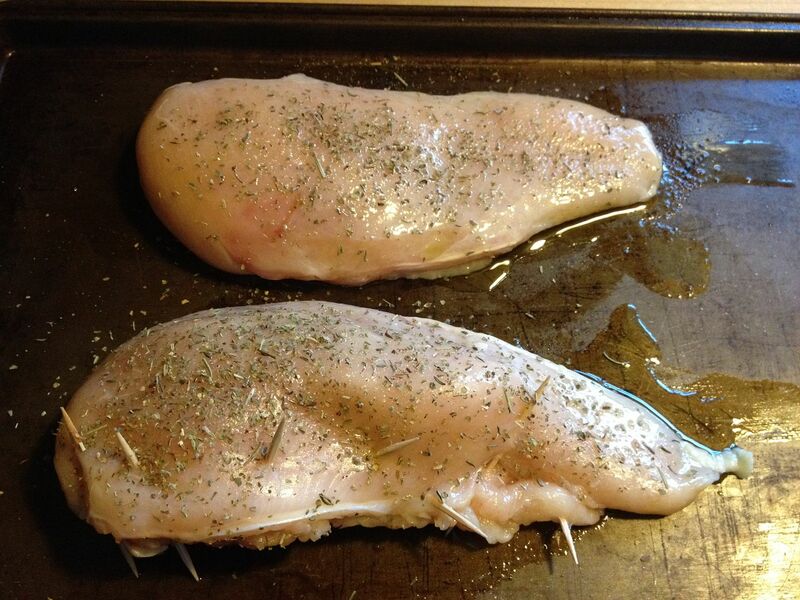 I set this aside, then rubbed the chicken with some olive oil, then seasoned inside and out with a blend of oregano, basil, thyme, granulated garlic, dried parsley, salt, and pepper. 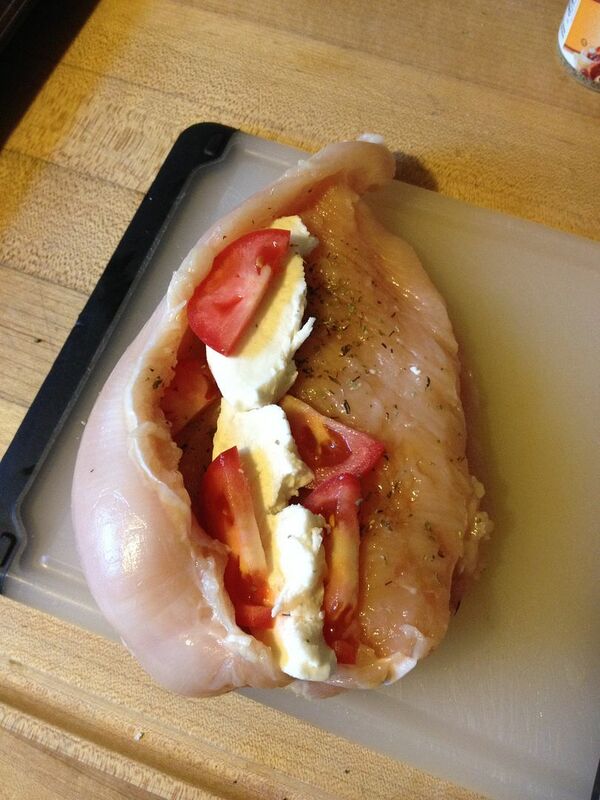 After seasoning I stuffed the pocket with the tomato and mozzarella. While I brought the sides of the breast together, Hope inserted toothpicks into place to close up the pocket and hold the breast together. Yes, we did go a bit overboard with the toothpicks, but I didn't want the cheese to ooze out during the grilling process. Next, I touched up the Italian seasoning on the outside and headed out to the hot grill to cook these behemoths. 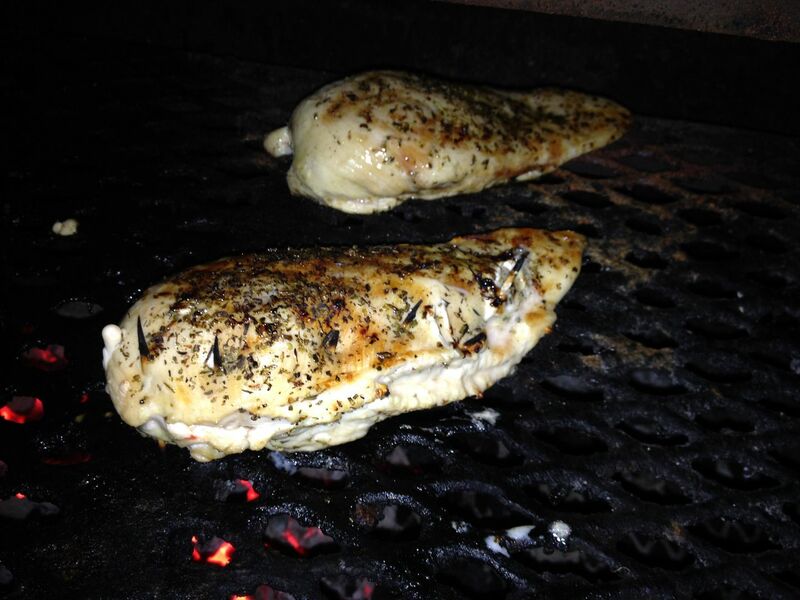 To grill these breasts, I seared them for about five minutes a side, the moved them to indirect heat. While on indirect heat, I placed them with the cut side up to minimize the amount of cheese that might escape. I closed the grill lid and came back 20 minutes later and poked them with a thermometer. Overall the cook time, including the 10 minutes of direct heat, was 40 minutes total to bring the meat to 165 F internal temperature. One of these was big enough for me and Hope to split for dinner. The Youngest dusted a whole one. I was very happy with how these turned out. To my surprise, the cheese ooze was minimal and probably would have been zero with some butchers twine. In hindsight, these could be a great base for some sort of healthy grilled chicken parmesan. I do know that since the Ice Cave is filled with these pterodactyl sized breasts, you might be seeing a few variations on this theme in the coming months. I am not sure I could share one of those with Ms. Goofy. I would want one all for myself. Great stuff. They were very good Chilebrown. I can wait to experiment with a few more.